The rest of this site is for pediatricians, but you parents are welcome to follow along. The main goal of this series is to show you the way that fluoride can be used to create good looking teeth. (This is slightly different from the historic reason to give children fluoride, preventing cavities. We want to do that, too, of course.) I would like to convince you that adding fluoride to childrens' teeth is like adding white pigment. You want the whiteness, but you want it to be blended in, not just slapped on. In order to blend in the white pigment, there are four key elements. First, start as early as you can to avoid a change in the middle of the tooth. Second, be consistent with the doses. Third, ease into any dosage changes. And fourth, err on the side of lower doses rather than higher doses. The photo is of a mango variety we love to grow in Hawaii. 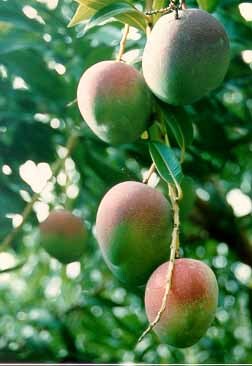 The Hayden mango starts out as a green fruit with a purple "blush". As the fruit ripens (the bottom one is the ripest, the top one is the least ripe) the green part turns yellow. The blush then starts looking red, even though its pigment doesn't actually change.